It’s no secret that the absolutely best meat that you can get is the kind that’s raised the old-fashioned way and the way the animals were meant to be treated on a farm, not from one of those confined animal feeding operations where they don’t see the light of day and don’t feel the grass under their hooves or feet. We went in with one of Ted’s friends again and purchased a whole beef from Ronnie Manning which meant we both got a side for our freezers (a side of beef means half of a steer each). We’ve had beef from other places, but Ronnie’s is the best by far. He’s also been very kind to us as we have started this venture with our own cattle, and he stops by here and checks on us every so often to see how we’re doing and see how the cattle look and give us advice. We picked up our side of beef from a local butcher shop where it was vacuum sealed and cut exactly the way I wanted. The cost for all of this was under $3 a pound. I cannot buy grass-fed hamburger for under $7 around here! We wound up with pot roasts, 150 pounds of hamburger, T-bone steaks, top sirloin steaks, club steaks, porterhouse steaks, ribeye steaks, cube steak, stew meat, packages of short ribs, organ meats, and a huge box of beef tallow that we are going to render down in crock pots and mix with bird seed to create our own suet blocks for our chickens for the winter so they get enough protein. We also got a huge box of beef bones for our dogs. 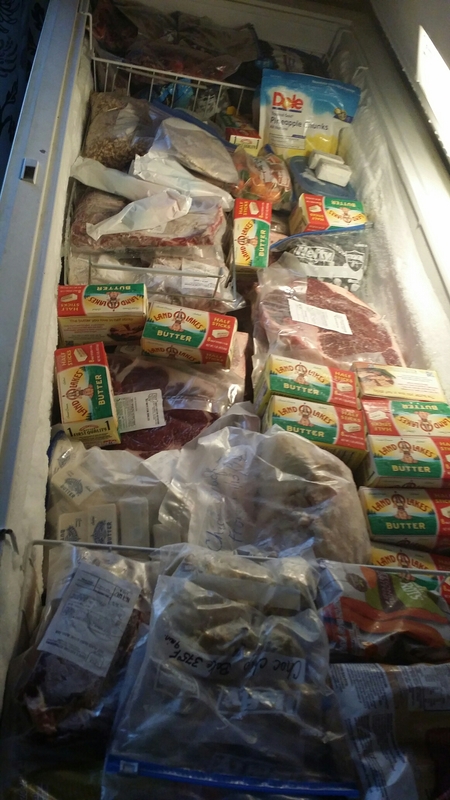 There’s more than enough red meat now in my freezer to last us at least a full year! There’s seriously so much meat in the freezer now that we have to get another small freezer before we can go to the pigs because there’s nowhere to put the pork once that’s done. If you are local to southern Ohio and looking to put good grass fed beef in your freezer, you should get ahold of Ronnie Manning. You won’t be sorry! We never are! Also, you do not have to buy an entire side of beef. You can tell him you want a quarter of a beef, and what he will do is put your name on a list and when he gets enough folks together to split one steer, he calls you all, and it gets split. It’s a very economical way to keep fresh good meat in your freezer, and it supports a local farmer who in turn supports the men who work for him on his farm. When you buy from a local farmer, you help support the local economy, and you vote loud and clear with your food dollars! Know your food, and know your farmer!